A couple of weeks ago now this correspondent was on a flying visit to Melbourne and had intended to re-acquaint myself with Penny Blue – one of my favourite bars in the Melbourne CBD. After a long day, I was on auto-pilot, gasbagging away with a mate and strolling purposefully towards the Driver Lane. I turned the corner off Elizabeth Street and got a shock. Driver Lane was gone and had been filled in by a new bar. Could this be right? Nah – I’d undershot my right hand turn of Elizabeth Street and was one “Little Street” south of where I’d wanted to be. Instead of Little Bourke I was in Little Collins. 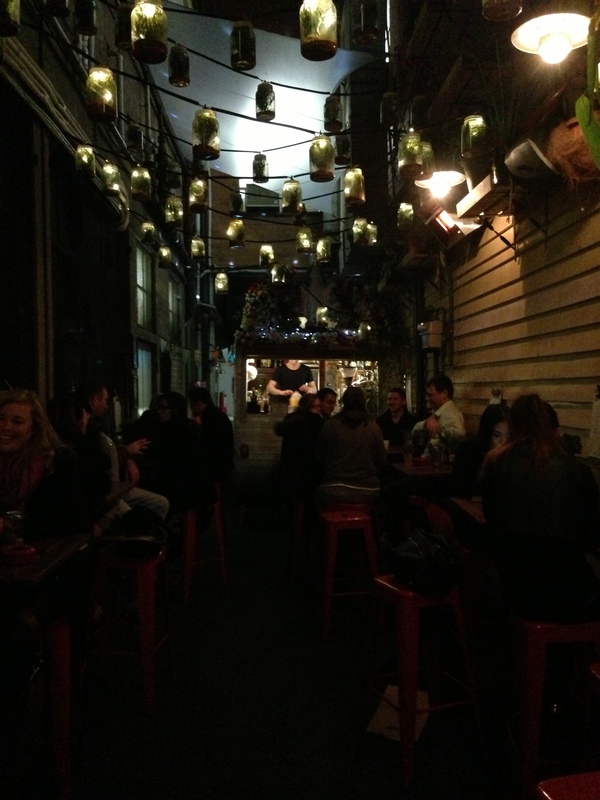 In Penny Blue’s corresponding position, I was confronted by a really well appointed laneway bar. Chuckle Park‘s address is 322 Little Collins Street and has made remarkable use of its space. At the end of the laneway is a fantastic vintage caravan that is used as the bar. On each side of the laneway leading up to the caravan are bar-stools and high tables with awnings and heaters protecting against Melbourne elements, whilst still providing the feel of being outdoors. Lighting is provided by very attractive jars and bottles strung up above the punters’ heads. It was a chilly night, but the heating was perfect and whilst it feels odd to describe Chuckle park as cosy – that was the feeling. With space at a premium, I was hardly expecting to find an @Untappd unique on what is a very tight beer & cider menu – where everything is in cans. 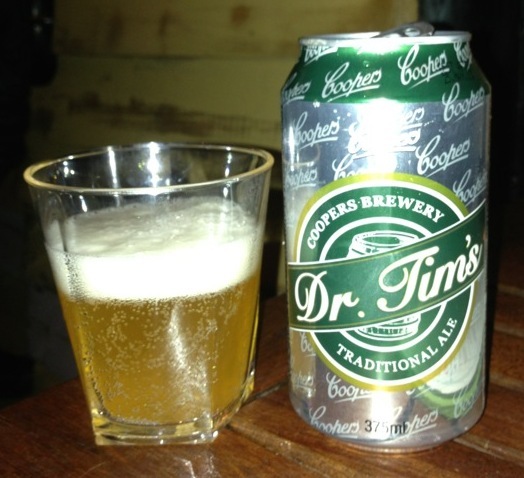 Dr. Tim’s Traditional Ale is named for Dr. Tim Cooper the 5th generation brewer and current Managing Director of Coopers Brewery Limited. It is a pale ale that is naturally conditioned in its aluminium can. It only comes in the can and has the cloudiness of Coopers Green without the sediment (not that I could see anyway). 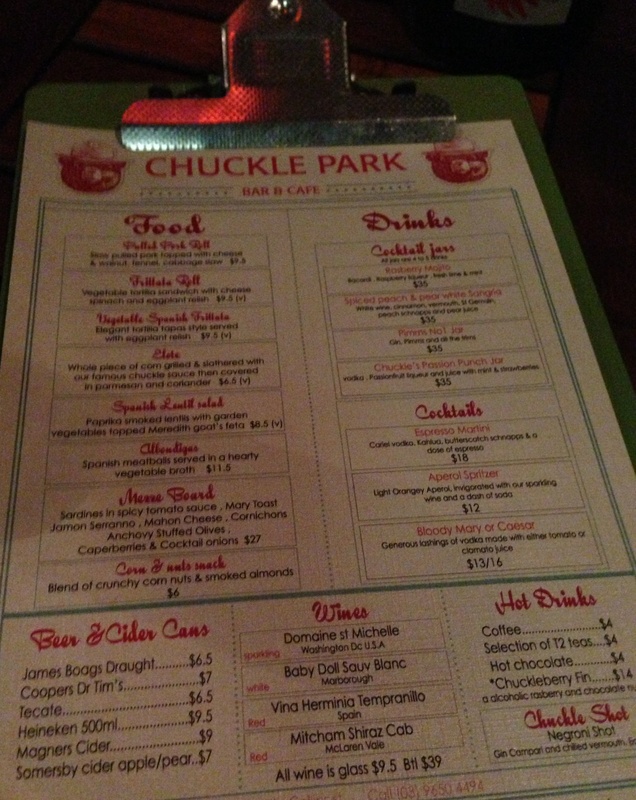 It didn’t have the same bite of Coopers Green – but was a perfectly way to wile away my time at Chuckle Park. 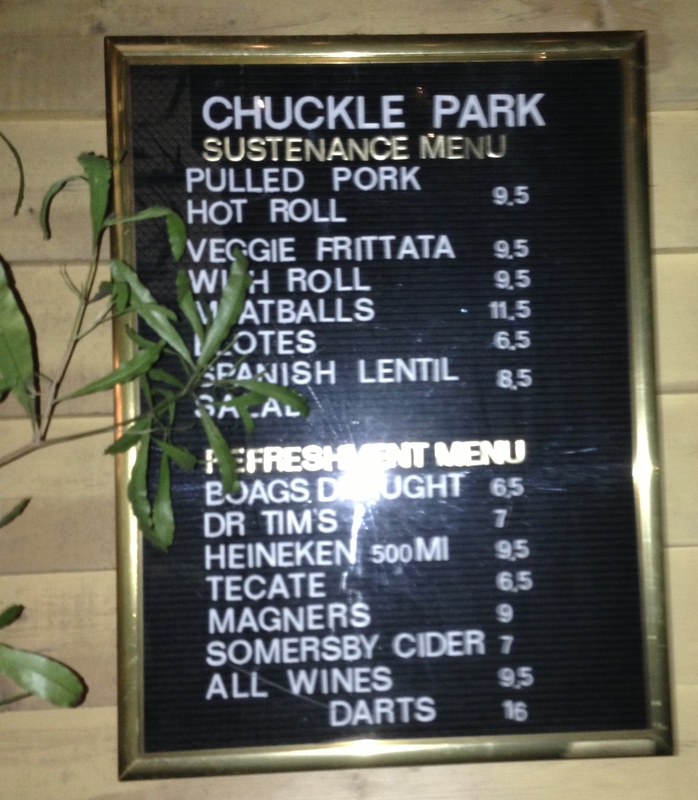 Given the rest of the beer list, Dr. Tim’s will be the go-to-beer the next time I return, which I will because I want to try Chuckle Park’s pulled pork roll. Yeah – the Pulled Pork Roll is 2013’s most common new menu item, but I haven’t tired of them yet. By the way, I did get to Penny Blue – and got to try Killer Sprocket on tap. That’s a good drop too, but a story for another day.